Both manufacturers’ vows are certainly appealing, at least at first glance. And numerous commentators seem to be hoping that more manufacturers will fall in line. Read this article in Bloomberg as one example. But scratch below the surface, and you’ll realize these pledges are no bargain. We explain why below. In an article captioned Perspectives from NNI President Jakob Riis on Pricing and Affordability, Novo’s President illustrates drugs’ exponential price increases and simultaneously provides his view of their cause. Translate Novo’s statement and what do you get? Today’s rebate is tomorrow’s price increase. Or, as we’ve previously described in a detailed article about rebates: Manufacturers and PBMs are in a two-step dance where price increases lead to ever-higher rebates, and ever-higher rebates lead to ever-greater price increases. Rationally, if manufacturers believe they are the victims of PBMs’ demands (as Novo and Mylan and several other manufacturers have recently asserted), manufacturers should respond by rejecting all secret PBM “deals” and instead openly disclosing their “net prices” to the marketplace. But no manufacturer wants to compete on price, which would inevitably reduce all drugs’ prices. Accordingly, rather than challenging and rejecting PBMs’ secret pricing deals, Novo chose to replicate Allergan’s pledge and vowed to limit Novo’s price increases to single digit percentages annually. What’s the Impact of Single Digit Price Increases? If a manufacturer raises its prices 9% annually, given the impact of compounding, the manufacturer’s total increase over 15 years will be 364%. 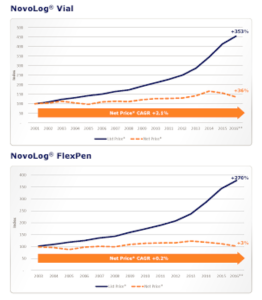 Double back and look at Novo’s Chart above, and you’ll realize a 364% aggregate increase is a larger increase than the staggering increase of NovoLog Vials and FlexPens that Novo claims it wants to address. If Novo and Allergan push the limit of their “Single Digit Vow”and raise their prices 9.99% each year for 15 years, their actions will result in total price increases that are even higher — 412%. Even if these manufacturers only extract “mid-level” annual price increases of, say, 5% (as Allergan indicated it might do), total price increases over 15 years would still be 208%. On what basis could anyone consider such single digit price increases reasonable, especially when average annual inflation for the past 20 years has never risen above 3.8% and mostly been far below 2%? Novo’s “solution” to affordability – and commentators’ responses – remind me of an old Jewish tale that underscores the absurdity of both. The story describes a farmer and his wife who live in a very small house with multiple children and can’t stand the noise. The couple heads to their Rabbi and asks for his advice. The Rabbi tells them to take their chickens inside. When the noise worsens, the couple returns to the Rabbi and again seeks his advice. The Rabbi tells them to take their goats inside. Days later, when the couple returns again, the Rabbi says “Bring the sheep inside!” Not surprisingly, the situation grows even worse. Finally, utterly beside themselves, the couple returns to the Rabbi, who tells them to remove all their animals from their home. Suddenly the couple discovers their home is quite peaceful. Manufacturers’ Single Digit Price Pledges may be superficially appealing. But don’t let Martin Shkreli’s 5433% price increase for Daraprim – or certain other drug manufacturers’ staggering price increases – dupe you into thinking single digit annual increases are a bargain. They’re not! If more manufacturers try this PR ploy, let’s hope that our media friends better analyze the impact of manufacturers’ vows. In the meantime, we urge every Plan to track AWP increases regularly, and take action wherever feasible. We won’t re-state our recommendations in that regard, but if you missed our previous article on the matter, we urge you to read it. Doing so will help you control your costs. Waiting for manufacturers to act on your behalf will not prove a successful strategy. To read other Rx Drug Alerts, go to the top Menu Bar, and click on Rx Alerts.